Thanks for everyone participated in solving the stadiums issue, missing important files included. smoke patch 2017 included tattoos but this caused many problems and crashes, the inclusion of tattoos will not be available for smoke patch and is not recommended to add any, tattoos in pes 2017 made conflicts with the stadiums graphics and crash issues in master league and BAL modes, in pes 2018 konami made a comprehensive tattoos system and it works perfectly but in pes 2017 this will not feature in smoke patch. if we find a safe solution in the future then maybe we will add them, but for the moment we do not recommend having them for the stability of the game. 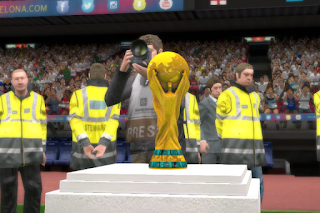 stadiums has been severely compromised when tattoos were present in the patch, some stadiums failed to load, others failed to finish, and some reported exiting in the middle of the game, however after removing the tattoos all stadiums should work properly now, we will keep collecting reports in case there are any issues with the stadiums. Please note that this version still needs revision for the final world cup squads, will be revised next update, this software was released early to fix the mentioned issues for the stability of the game. New season=new patch? or simply updates 9.8? Thanks! too soon for new season, it will be update too. Damn this make my day, to know that new season for Pes17 will be updated too. Thank guys. هل لديكم النية في المستقبل لإضافة بعض النوادي الإفريقية مثل الوداد البيضاوي والترجي الرياضي التونسي والأهلي المصري ..
Best patch ever, but i want more minifaces for each wonderkid and young players. Thank you, Sir Dido! this patch is good..it fixes al the error..but the faces are back to previous patch..like isco or carvajal..can it be fixed..and also if you pls improve the graphics of pes 17 a little more it will be very good..and also thanks you sir..
Have you returned the old faces? again, keeps the loading problem at the end of a game (world cup)..
reinstall the update, DO NOT generate. I never do "generate", but when you wrote "generate", you mean with generation tool? yes problem error in world cup .-. Why this version failed ?? Bueno primero que nada GRACIAS por arreglar el problema que tenia que se congelaba el juego antes de iniciar el partido, reinstale el smoke patch 9.8.0 - World Cup edition, elimine el archivo EDIT00000 y luego instale el update 9.8.3b. Empeze una nueva copa y puedo guardar sin PROBLEMAS y seguir jugando la copa sin errores, muchas gracias por este gran TRABAJO. The patch here is very top, I just did not like one thing! UPDATE, 2 games so far in WC (World Cup), and no loading problem. Thanks. I'll update if anything occurs. For now game not freezing, but i will testing and write report. Thankn's once again for your work. Dido! the lineups are not so good.in Russia all nonsense,Kudryashova no,Dzuba, etc. Remove players which finished korero of free agents,there's a lot of players who are under 40 years!what they need!! !Leagues and cups with the wrong name.England generally called a girlfriend,that kind of nonsense!And please make the selector and the missing clubs in the Champions League and Europa League,thanks in advance!!! And Dido!When doing transfers,it flies the face,I change shoes, too.Please I beg you!you don't play, you just reinstall! Hello again. Every time when i changing players on the screen flashing white rectangle. It's on the Premiere League scoreboards. Not big deal but if this can be fixed whould be nice. У многих игроков остались отметки татуировок, cделайте фикс для этого не приятно играть. Есть еще не которые моменты, у многих игроков поменялись лица на старые, а так в основном пока не замечал, каких либо проблем но все ровно нужен тест. Some players has problems with texture. I found more texture problems. Tunisia national team face in the next update please !! Turf is good but there are old faces (I did not generate dpfilelist). New faces were better (9.8.3), will they come back? Thanks! can you make update for the world cup stadiums ? all problem fixes exept for MODRIC face and KROOS's hand . Don´t forget to check this. All Players Heads, Including National Teams and Extra One's. All Kits only they show White. Missing a Few Manager Licences, please use Wikipedia for the latest coach transfer from this year. Freezing Argentina vs Russia WC in Anfield..again. Dido when you add new kits of FC Juventus for the season 18/19?? Its not crashing now. Thank you very much Dido. is there an 1.05 version and Data pack 4.0 for pes 2017? Also, what about the summer transfers? I think it's a GREAT WORK! But I have a problem. When I play in some stadiums (San Siro, Camp Nou, Stade de France...) the SKY IS PINK. Can somebody tell me why it happens? more feedback, some players from barça and real madrid, so bugged! etc.. Please, add Alejandro Marqués (Barcelona B - Venezuelan) in the next update. Hi. Can we add more stadiums. Do you have bigger stadiums slot and in yes, how we can add more stadiums. Will you help me please in this issue. I have tried many times, but failed. Thanks. Islands Cook next update ? Download new face and replace, done. Then, if I delete all of the programs(9.8.3 + 9.8.0) and reinstall them from the beginning, will it run? After deleting all the pes2017 and all patch files, I tried installing them again. However, an error occurred when playing at Anfield Stadium during the Master League. The error is that the game is turned off. ¿Puedo jugar online en el pes 2017 pirata? will u update pes 2013 too ? Thanks forur work. It Looks good but are u sure there's no problem when generating dpfile? E. Latte Lath is duplicate. one of the Romanian player was invisible. forgot his name. he's the subs that my team faced against. just can see his shadow during the game. hard to defend against him. maybe it's just with me but, the Part 15 of the patches keeps corrupting when being extracted. i hv similar problem with part 13, redownloading does not help. any one with solution? Most of the national leagues and cups are not with their real names, such as La Liga Santander, FA CUP, Premier League, Copa do Brasil. Several players from national teams from Asia and playing in Asian teams are duplicates. In relation to the Brazilian teams the name of the stadium of America MG is Independência, not Serra Dourada. Atletico MG, Cruzeiro and América MG are rivals. Corinthians is not rival of Paraná. In the rivals of Corinthians, replace the Flamengo by Palmeiras as rival. Palmeiras is Corinthians' biggest rival. In relation to the Argentine teams Vasco da Gama (from Brazil) is not a rival of Boca Juniors. Boca Juniors is not rival River Plate in the game. It is the greatest Argentine classic. Please adjust these items in the next update. Every time there is a new patch update I lose the edits. When can you add russian commentatory ??? puse el ultimo parche y me aparecen unos jugadores con el nombre de "Original Player" sin caras ni nada, quisiera saber si lo podrian solucionar, gracias. Juventus Stadium is a very bright sun.The football grass looks like a swamp. not comfortable to play. Do not see the ball on the grass. In the next update, fix the grass of the Juventus Stadium please!!!!! Sir, please update a players and faces of Malaysia National Team and Johor Darul Ta'zim. Thank you sir! i have pes 17 with the first datapack of the game can i download the patch? Can I please have the order of the CPKs on the DP File List Generator? Thank you so much for the great work. I know that you are going to make a new patch for the next season but I want to know if I can do some player transfers right now without this giving future problems to the game. Thanks. Can anyone help me,i want to test boot pack but i dont know the name of the boot cpk file in the download folder ? which one of them ? Pls when you update can you provide a link for only the edit file cos I had to redownload some of the parts of the patch since it was damaged.. thanks for the patch too, u r the best. What do you mean by saying "do not generate" ? Can you explain it using tutorial video pls? I installed the latest update, but when I play WC games on Anfield game is crashed sooner or later. It always occurs during a replay before a corner kick.